Model Adriana Lima carries the Olympic torch in Maua Square in Rio de Janeiro, Brazil, August 4, 2016. The 2016 Olympic Games in Rio de Janeiro officially kick off Friday night with an opening ceremony in Brazil’s Maracanã Stadium, marking the first time the games have ever been held in South America. Media coverage in the lead-up to the games has been dominated by negative stories about problems with polluted water in the host city, violence in the streets and a Russian doping scandal, among other things, but organizers are hoping to move past those issues and use the opening ceremony to show a different side of Rio. "I hope that the opening ceremony will be a drug for depression in Brazil,” said Fernando Meirelles, one of the creative directors behind the opening show. “Brazilians can look at it and say, 'we are a cool people, we are different ethnic groups, we live together, we never went to war, we are peaceful, we know how to enjoy life and we tend to be happy.'" Meirelles is a native of Brazil and the director of the Oscar-nominated movie "City of God", which tells the tale of life in Rio’s dangerous favelas. He said he is working with a budget of about $56 million to produce four ceremonies – opening and closing ceremonies for the Olympics and Paralympics – which he said is about 20 times less than the budget for the 2008 Beijing Olympics. "I have never done anything on this scale, and will never do so again in my life," he said. The ceremony – which is expected to draw upwards of three billion viewers worldwide – will showcase Brazil’s native bossa nova music in a carnival-style celebration with samba dancers shaking their hips. The Local Organizing Committee for Rio 2016 said the ceremony will feature dancers from 12 samba schools in Rio, Brazilian pop star Anitta, and musicians Caetano Veloso and Gilberto Gil, who were exiled from the country by Brazil’s military dictatorship in the late 1960s. Members of Canada's Olympic team parade past dancers following a flag-raising ceremony at the Athletes Village in Rio de Janeiro, Brazil on Aug. 2, 2016. "This is the moment we were waiting for," said Rio 2016 spokesman Mario Andrada. "There is an important tradition that a good opening ceremony is a good sign for the rest of the Olympics. It is beautiful, it is very Brazilian. The people involved are very proud." Organizers of the event have been very tight-lipped about who will transfer the Olympic flame from the torch to the cauldron, but Brazilian football (soccer) legend Pele has said he was invited to do the honor. Rio organizers, though, would not confirm the information. Notably absent from the opening celebration will be Brazil’s suspended president Dilma Rousseff, who was recently replaced by her former vice-president Michel Temer as she faces an up-coming impeachment trial over corruption charges. Athletes from 206 countries and regions, and a team made up of refugees will compete in 28 Olympic sports. Some of the more well-known flag-bearers for each country include Michael Phelps of the U.S., Andy Murray of Britain, Caroline Wozniacki of Denmark, Yane Marques of Brazil and Rafael Nadal of Spain. Syrian refugee team swimmer Yusra Mardini, 18, from Syria practices at the Olympic swimming venue. For the first time ever, the Olympics in Rio will feature a team made of refugees from several afflicted countries meant to draw attention to the plight of other refugees. The 10 athletes – six men and four women – will compete in swimming and judo events, and will march with the Olympic flag during the opening ceremony. The team includes refugees from South Sudan, Syria, the Democratic Republic of Congo and Ethiopia. One of the athletes, swimmer Yusra Mardini, was on a small boat headed from Syria to Greece last August when the boat began to capsize. Mardini and her sister jumped out of the boat and pulled it for more than three hours before they – along with several people on the boat who couldn’t swim – made it to safety. Mardini now trains in Germany. Members of the Russian Olympic delegation line up to board a bus after arriving at the Rio de Janeiro International Airport July 29, 2016, to compete at the 2016 Summer Olympics in Rio de Janeiro, Brazil. Russia is breathing a collective sigh of relief after the International Olympic Committee approved 271 of its athletes to compete in the games. A state-approved doping scandal put Russian participation in this year's games in doubt. The IOC announced its decision Thursday night, less than 24 hours before the Olympic flame is lit, but 118 Russians are still barred from competition, meaning the Russians will field their smallest Olympic team since 1912. The entire Russian team was facing a ban after it was revealed many of them had taken performance enhancing drugs with the approval of the Russian Sports Ministry, along with evidence that Russian officials tried to cover up the allegations. There will be no Russian track and field, rowing or weightlifting teams this year. But the IOC is continuing to hear Russian cases, and more athletes could be allowed to compete before the games end. 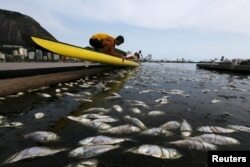 Dead fish are pictured next to a rowing athlete as he puts his boat on the water before a training session at the Rodrigo de Freitas lagoon, in Rio de Janeiro April 13, 2015. Earlier this week it was revealed Rio’s water is contaminated with raw sewage that could put athletes who compete in water sports at serious risk of contracting dangerous viruses. A study commissioned by the Associated Press showed infectious adenovirus readings at nearly 90 percent of test sites. Even the sand showed high levels of viruses. Samples from beaches at Copacabana and Ipanema showed dangerously high levels of pollution. The most contaminated points are the Rodrigo de Freitas Lagoon where Olympic rowing will take place, and the Gloria Marina, the starting point for the sailing races. The report said that consuming just three teaspoons of water in Rio would more than likely lead to illness. 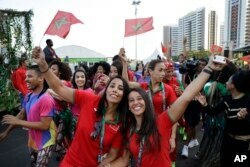 Moroccans Rizlan Kaida Zouak, a judo competitor, left, and Hind Jamili, a canoeist, celebrate at a welcoming ceremony at the 2016 Summer Olympics in Rio de Janeiro, Brazil, Aug. 4, 2016.